From Enchanted Conversations Magazine: We promised a contest for this issue, and here it is! 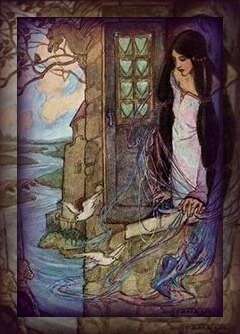 Your task is to do a retelling of "Rapunzel" in 2,000 words or less or write a poem. The normal rules for submissions guidelines apply in terms of content. You must also be a follower either through the Google system at left, or on Twitter. There is no fee to enter. Up to four winners will be chosen -- stories and poems in any combination. The prize is a $35 Amazon gift certificate for each winner. The contest starts at 11:59 p.m. on April 1, EST, and ends at 11:59 p.m. April 8, EST. Here's a link to "Maiden in the Tower" story types, to help inspire you.We decided to do a different fairy tale from this issue's theme just for fun! We can't wait to read your submissions.